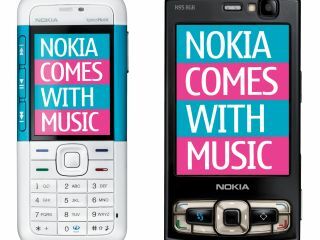 Nokia will be thrilled to find out that its Comes with Music service will be available from more outlets than just The Carphone Warehouse after 3 has unveiled a handset, the Nokia N96 8GB, to carry the service through the network. Well, Nokia actually probably knew it was going to happen, given they'd have to have been heavily involved in the negotiations, but still, probably a warm Finnish glow is ensuing. Nokia will be doubly happy about 3 picking up the service in the UK, as there were a few rumblings from the network operators about CwM competing with their own similar-ish services. If you're contracted to 3 and interested in getting your hands on Nokia's new music service, it will be available in less than a month from the network, from 3 November. The Nokia Comes with Music N95 8GB is available on an 18-month contract with 300 mins/texts, and 1GB of inclusive internet access for £35, which isn't too shabby. The N95 8GB with the service is available at The Carphone Warehouse on Orange too if you're not interested in 3, and you can get the handset for £40 per month with Dolphin, which gives you a few more mins and unlimited text. Don't say we don't bring you options.